Brock Lesnar made his intention well known to come back to the Octagon a year ago and before signing a new contract with WWE, he seemed to make peace with the idea of leaving it all behind. Somehow, I felt that he was lying to himself, and really wanted to come back to UFC, but wasn't confident enough to do so. As time went by, Brock has become increasingly lazy in the ring, as evidenced by the lackluster and underwhelming performance he gave against Dean Ambrose at Wrestlemania 32 and uninspired momentum he's carried since after Wrestlemania 31. Brock seemed reinvigorated with his Cena and Seth Rollins feuds, spawning his Suplex City movement, but since then, it's been pretty bland to say the least. With that, I wondered if Brock maybe was bored of the WWE world and clamoring for something more, yet again. Interestingly enough, Brock was announced out of nowhere to be a part of the UFC 200 event on July 9th, going back to the MMA world for an one off opportunity, though it remains to be seen if it's just a one time thing or if Brock has greater intentions beyond one time. This is where things tend to get a bit fuzzy in retrospect. WWE reportedly granted Brock the one opportunity to be a part of UFC 200 while still under contract to them, a move that's earned a lot of criticism and rightfully so. If there's any man that has seemingly gotten over on the company in the last few years, it is none other than Brock for sure. 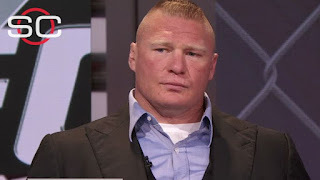 Brock makes upwards of 5-7 million dollars per year to wrestle maybe 10 times a year and appear maybe 25 times a year on TV. He takes months off at a time and doesn't have to travel as much as the regular crew, yet he gets paid much more than 99% of them. Though in reality this is unfair, the WWE rationalized it by thinking that Brock would provide a bigger upside and that they could make back big money on this investment. Brock only gives WWE about 25-50% of his potential and work ethic, working the Rumble, Mania, Summerslam, and the usual one off PPV during the year. He's booked for Summerslam this year, though this isn't necessarily exciting due to the rumors swirling around about who his opponent is. 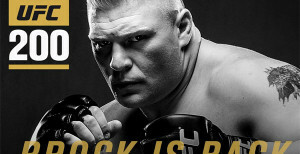 So, with Brock giving the WWE only 50% of what he could, is this UFC thing a good thing or a bad thing? I say it's a bad thing completely. There is no real upside to this. Brock went back to WWE after leaving UFC. 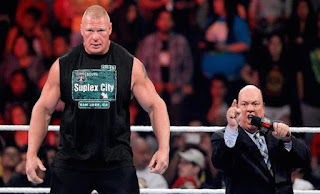 Brock has been back in WWE now for 4 years part time, which is technically longer than his original tenure of about 3 years full time, and him going back to UFC is risky for the investment that WWE has placed in him. Where would it logically be smart to have Brock go into UFC again and fight? Win or lose, this does absolutely nothing for the company and it seems as if the WWE is just once again conforming as much as possible to make the spoiled and overpaid Lesnar happy. Now, I like Brock. Always have. But let's be honest here: Brock going back to UFC does nothing for the WWE. The only way this would have any impact for WWE is if the UFC made a trade to allow CM Punk to work Wrestlemania 33 coming up and that is next to impossible. Vince is an idiot so I'm sure he doesn't really know that the concept of a Brock to UFC trade for Ronda Rousey to WWE at Mania 33 isn't smart. After Ronda lost to Holly Holm, that ship sailed completely. That's the issue essentially with bringing in UFC fighters to WWE. If they aren't massively over and likely undefeated, the impact is severely watered down on the product and the fans themselves don't really care. Sure, Ronda at Mania is a quick headline grabber, especially if she's wrestling, but it is not the attraction it would have been about a year or so ago. Thus, this is really not a smart trade for WWE if that's the plan. 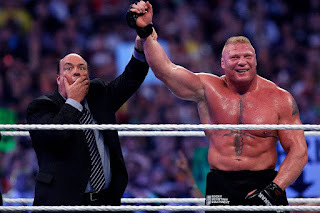 Also, Brock fighting Roman Reigns for the WWE Title at Summerslam is the most likely and boring main event possible, and most people don't want to see this again. If Brock wins at UFC 200 only to lose to Reigns clean at Summerslam, this would ruin damn near everything that they built up Brock for. Reigns is still struggling weekly and unfortunately, putting him over Brock doesn't really help things or help the business, it literally minimizes the impact of Brock going forward and only serves to force Reigns yet again, which is not working. 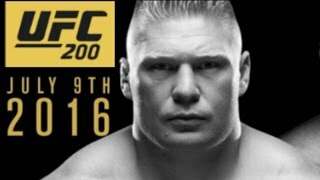 So why put Brock vs Reigns as the main event especially if Brock fights at UFC 200? The logical step would be to put Brock against an up and coming star in a semi main event to utilize his draw ability while still pushing a big feud ahead for Reigns that isn't Brock. This is probably the dumbest move on the part of WWE and will likely backfire on them, especially if Mark Hunt manages to beat Brock. 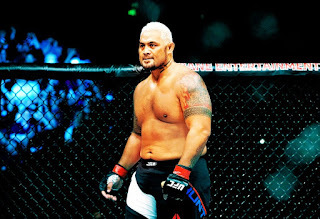 If Mark Hunt beats Brock, then the WWE version of Brock loses all luster and momentum. And though it is doubtful Mark Hunt beats him, the underdog role for Hunt could motivate him and get him to win. If that happens, this whole ordeal becomes a waste. So, what if Brock wins. Then what? You beat a relatively unknown in Mark Hunt then you just go back to WWE? What does that do? Nothing really. There is not a single upside to this deal for WWE and once again, they prove why they aren't in better shape than they need to be. Sorry WWE, but you played yourself. And Brock played you as well. Get that money, right Brock? That's all that matters. Fast forward to the conclusion of Jedrzejczyk's scrum along with a reporter circled back around to asking her to get a prediction. When Jedrzejczyk disclosed she had been 50/50, the reporter subsequently shifted to asking her about McGregor's behaviour.